Pomeroy’s on Kilmore Boutique Accommodation interior, before photo of street frontage next door to Pomeroy’s Pub. Pomeroy’s on Kilmore Boutique Accommodation interior, “before” photo of street frontage. The cover of the compendium is handbound cloth hand embossed with a frieze of daisies found in one of the boutique’s original leadlight windows. THE BEST DESIGN—design that moves people’s hearts and minds—has something more. It expresses a concept, a great underlying vision that combines imagination and wisdom. Without a great concept, it is fair to say, design is only superficial decoration. A great concept is what gives purpose to the communication art of design. The design of Pomeroy’s on Kilmore Boutique Accommodation’s brand and corporate identity components, from signage to print & web, to bathroom products is all about vision—the art of imagining and thinking and seeing a world that does not yet exist, and that needs graphic design to bring that to life. “Pomeroy’s and daughters and son” is a family business, having welcomed lots of guests through its doors over the previous eighteen months, in 2007–8 Steve and Victoria Pomeroy decided to complete their plans to fully refurbish, upgrade and rebrand the colonial villa, formerly known as Pomeroy’s B&B from 2006. 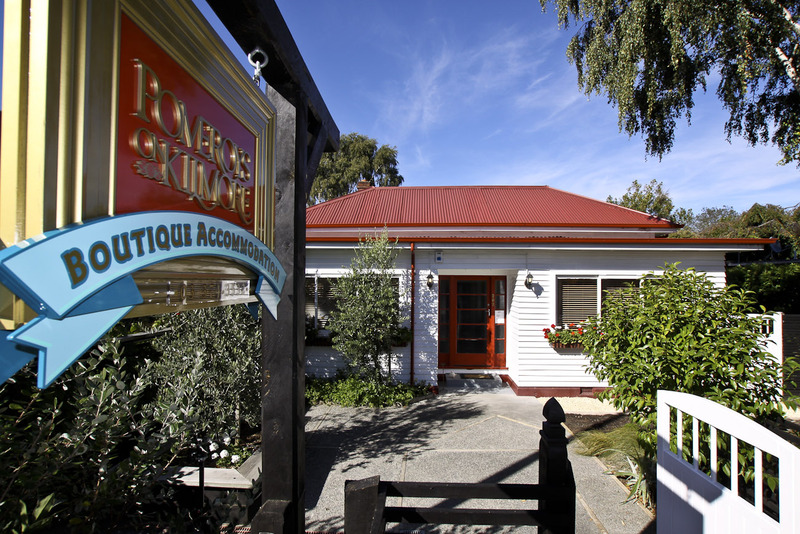 Snug, comfortable Pomeroy’s on Kilmore Boutique Accommodation is centrally located next door to Christchurch’s own historic, English-style pub! Managed by Ava the atmosphere is private and personal, complete with delicious continental breakfast, what more could you ask for but their fantastic value tariff? Steve’s career in construction and Victoria’s flair for interior design came together in a great luxury b&b concept that positioned Pomeroy’s on Kilmore as a top of the line B&B. Pomeroys family portrait with their dogs across the road from pub. Clockwise L to R, Ava, Keeley, Steve and Victoria. Pom’s Bo’, as it is affectionately known, is a sophisticated eclectic somewhat glamorous b&b that marries the charm of colonial inspired interiors with high-end finishing of every detail, from the meticulous fit and finish of the construction on the building’s good bones, to the top of the line carpets, wall coverings, tiled bathrooms, lighting and every single functional yet stylish human touch-point, throughout, being top-of-the-line. 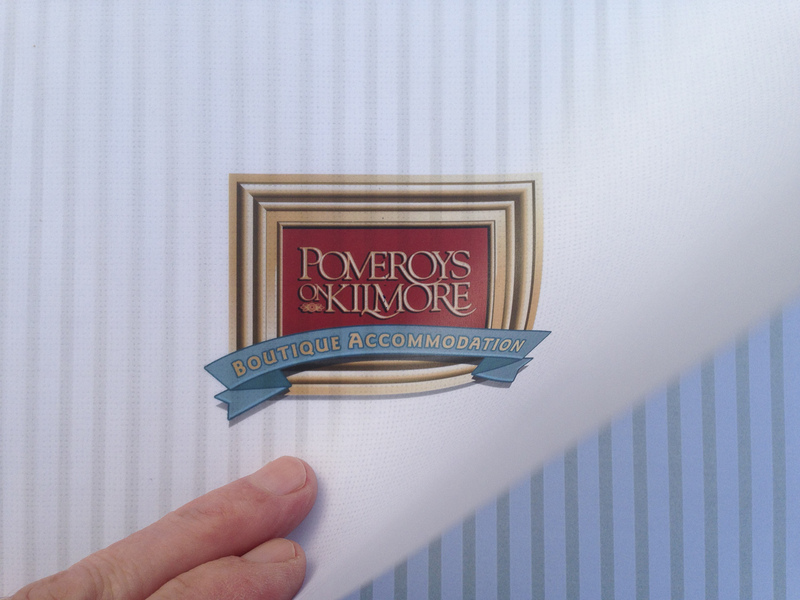 Pomeroy’s on Kilmore Boutique Accommodation street view. 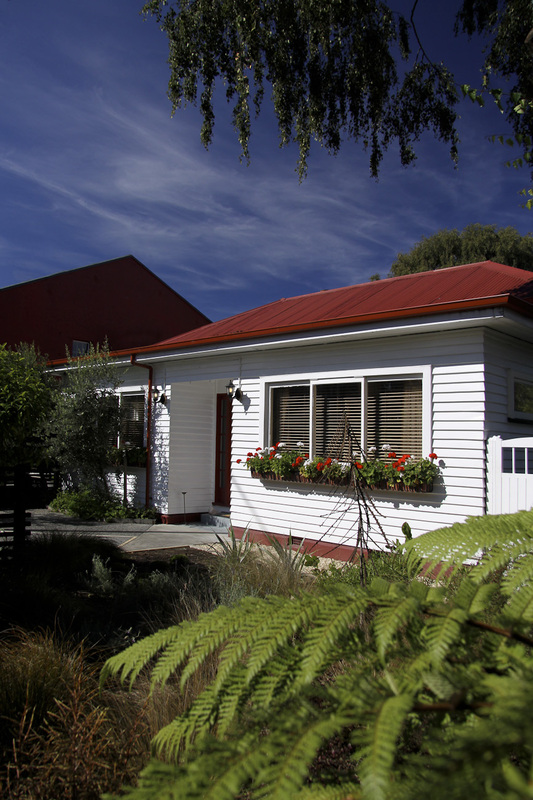 Ten years later, many adventurers to downtown Christchurch New Zealand happily partook of the Pom’s Bo’ world of a hospitable and glamorous b&b right next door to a friendly English style “gastro-pub”. Pomeroy’s on Kilmore’s branding creator, Shaun Waugh, had been working on the Pomeroy’s pub account since 2003 as graphic-designer-turned-brand manager. The story is that a visit to the boutique while it was under construction and a close inspection of the colonial elements of the original building that were being carefully conserved by Steve and his construction crew. Then sitting down with a sketch pad and a pen conjured up one of the best colonial villa b&b branding concept ever, centred on the concepts of “truth to materials” and “the design of a feeling” that fit Pom’s Bo’ like a glove. The hand crafted street sign is beautiful and in the context of the well presented building on Kilmore Street conveys a feeling about Pomeroy’s Boutique B&B. The care and craftsmanship express the concept and underlying vision of Steve and Victoria Pomeroy for their new business venture. The hand-crafted three dimensional signage followed, with a frame fabricated from the same generously sized colonial skirting boards’ profile that Steve had had made to order by a Christchurch specialist colonial joinery shop to completely refit the building. The metallic gold lacquer finish, classic typography logotype and period decorative elements gain and sustain our attention. The care and and craftsmanship that went into the design and fabrication of the hand made sign expresses the underlying vision of the client’s imagined world of a glamorous bed & breakfast adjacent to their hospitable and warm hearted English style gastro-pub, Pomeroy’s O.B.I. The traveler’s compendium of house guest and travel information took shape in the designer’s mind as a “truth to materials” and “sophisticated retro-colonial feeling” concept. Shaun didn’t work the design up from visuals, he worked from the concept. The concept becomes the umbrella, and everything fits inside of it. He brought all the disparate elements together, conceptual, visual, high quality photos of the interior and exterior of the b&b and the pub—and then design from the paired central impulses. These are the first few elements that came together to characterise the energy and consistent effort of Steve & Victoria’s Pom’s Bo new idea. Turning the frontispiece of the hand bound traveller’s compendium inside the substantial embossed cloth front cover. Just like the interior of Pomeroy’s on Kilmore and Pomeroy’s Pub next door, when you look into every nook and cranny in the business’s bricks and mortar, Victoria and Steve don’t leave any empty spaces. Everything from the pub bar to the restaurant, the standalone café and the boutique b&b. Everything is designed to fit. That is why the handcrafted design of the Pom’s Bo compendium that puts all that together is so compelling, it is a genuine reflection of what the client’s name stands for in their market niche, its qualities, and their business need. 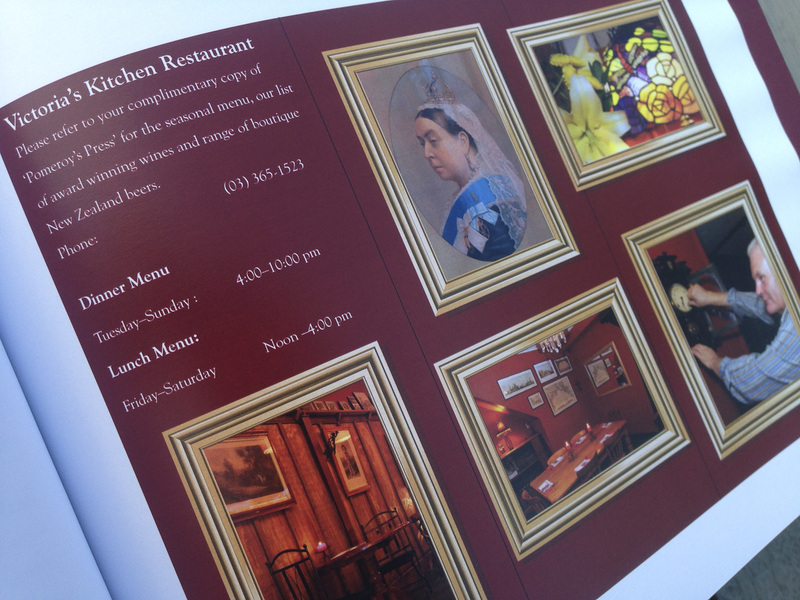 Echoing the bespoke interiors of Pomeroy’s on Kilmore luxury B&B and the client”s English style pub next door, when you look into every nook and cranny of the brochure there is something artful to see and think about. Design played a key role in the success of Pomeroy’s business from 2003–2010 from the time Shaun designed the building exterior repaint by collaborating with Victoria Pomeroy. Design is communication. Design communicates the feeling, the message, the spirit of Pomeroy’s famous hospitality, all the values of their business. It’s the framework that holds everything together.